Re-reading the Fantastic Four comics from the start. Issue #42 finds us still in the middle of a multi-part story in which the Frightful Four turn the Thing against the rest of the team. Hope you like fighting. Enraged and mind-controlled by the Frightful Four, Ben is about to pummel Reed, who caught in the Trapster’s super-glue. Reed deflects Ben’s blows by stretching himself into a cushion-like state. Elsewhere inside the same house, Johnny has been hooked up to a device that will douse him with water if he tries to use his powers, he deduces that he can heat up fast enough to destroy the machine before it can react, which works. He frees Sue from the plastic bag she’s trapped in, and they join the fight. The Frightful Four – Medusa, the Wizard, Sandman, and the Trapster (formerly Paste-Pot Pete) – fight back, and it’s a brawl. Johnny is too fast for Sandman, but not for Trapster, who snags Johnny in a cage made out of paste bars (!). Sue takes on Medusa, but gets tangled up in Medusa’s wily hair. Ben takes a few more swings at Reed, unwittingly breaking Reed free of his trap. They fight for the next three pages, tearing apart the Frightful Four’s mansion. Ben finally knocks Reed unconscious. Reed is apparently in a pliable state while out cold, so Ben stuffs him into a tiny metal container (where’d he get that?) and sealing it so Reed can’t get out. 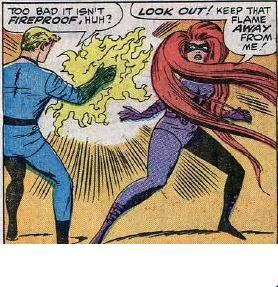 Meanwhile, Sue successfully fends off attacks from Medusa, Sandman, and the Trapster as Johnny escapes from his cage and rejoins the fight. Ben shows up, just in time to add to the battle. Sue escapes while invisible, but Ben and the Frightful Four capture Johnny and knock him out. The Wizard decides to hook Johnny up to his id machine, just like he did with Ben in the previous issue, making the Frightful Four now a frightful six. Sue managed to get a hold of Reed’s canister as she escaped. Now in the woods outside the house, it takes all of her strength to force the lid off, so Reed can escape. They make their way back to the house, where the Wizard has left a lot of his high-tech gear sitting around outside (I thought he was supposed to be the smart one). Reed uses tear gas machine and the Wizard’s anti-gravity discs to get the bad guys out of the house. Reed incapacitates Ben with an anti-grav disc, but Johnny attacks, surrounding his former teammates in a wall of flame. And… to be continued, again! Unstable molecule: Does this issue mean that Reed turns into a Play-Doh like state every time he falls asleep, or was this just because Ben beat him up so severely first? Fade out: This issue is pretty much all about Sue. She takes on the whole Frightful Four by herself, managing to rescue her husband as she does so. 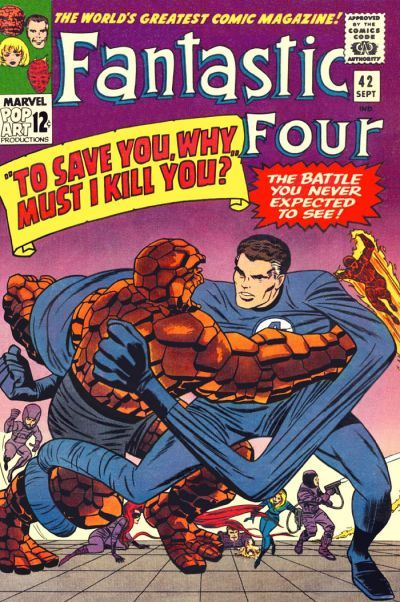 Clobberin’ Time: Ben is reduced to merely a monster in this issue, here to throw punches at our heroes. That’s kind of odd, considering that his feeling like a monster is what kicked off this plotline two issues back. Flame on: During the fight, Johnny creates a “sunburst” with his flame, temporarily blinding his enemies. This is another example of Stan Lee and Jack Kirby always thinking of new ways for the characters to use their powers.